80,000 Emails: Since we launched our business, we have sent and received over 80,000 emails and have had over 15,000 professionals join our training programs. Among those 80,000 emails, we have found that 20-30 questions come up over and over again. We have created this page of our website with questions and answers to help you easily and quickly learn all about our certification programs. Thank you for visiting us here at the Business Training Institute! If you can’t find an answer to your questions below please try our click to chat service, email us at Team@BusinessTraining.com or call us at (305)503-9050. 1) When do your training programs start? 2) Are the courses on BusinessTraining.com accredited? 3) When are the exams offered? 4) How long does it take to complete a course? 5) How do I schedule my examination? 6) How much does tuition cost? 7) What are the benefits of completing your certification programs? 8) When and where do I take the exam? 9) What if I have questions about the course material? 10) When will I get my test results? 11) How can I utilize the “author status” position I have earned as alumni? 12) Why should I consider hiring someone who has completed one of your certifications? 13) Do you offer tuition scholarships? 14) Why should I pay for my employees to complete one of your certifications? 15) What makes the certification programs offered at BusinessTraining.com different? 16) What can I add to my resume or business card after passing the exam? 17) I live outside of the United States, can I still earn one of your business certifications? 18) How do I register for the program? 19) What happens if I do not pass the exam? 21) Can I change my examination date? 22) Where can I get the required books? 23) Can I take two programs at once? 24) Are there any program prerequisites? 25) What score do I need to pass the examination? 26) Do I need to pass each module of the test to pass the whole exam? 27) I am currently a student. What are the benefits of earning one of your certification programs for me? 28) What methods of payment are accepted for the tuition? 29) How much will it cost to complete two of your certification programs over the next year? When do your training programs start? Registration for BusinessTraining.com programs is open on a rolling basis, allowing you to join and begin our certification programs at any time. You can complete the program in 1-2 months or over 12+ months, studying just 45 minutes a week, or 8 hours a week. Since our programs are based on required readings, a study guide, and video modules, it can be completed at your own pace and on your own schedule. Are the courses on BusinessTraining.com accredited? Our courses are accredited by The CPD Certification Service. The CPD Certification Service was established in 1996 and is an accreditation platform working across all sectors, disciplines and further learning applications. CPD uses rigorous guidelines that must be met in order to provide accreditation. The CPD Certification Service works internationally with organizations ranging from small consultancy firms to large training providers such as Business Training Institute. When are the tests for programs offered here at BusinessTraining.com? Our exams are held on the 1st Wednesday of each new month. No custom examination dates are offered. We do not and cannot allow any exceptions to this due to the volume of email inquiries and participants we work with. Once registered for our programs, you will complete the course project (further explained in each program study guide). After completing the program project and submitting it for grading, you will be able to choose your exam date from the twelve offered each year. Please send in the completed project and notify us of your exam date at least 2 weeks before the scheduled date. You can schedule your examination and send in the completed project with our scheduling form here. All of the programs offered at the Business Training Institute are 100% online and self-study, meaning you get to set your own schedule. We recommend ~100 hours of studying to prepare for an exam, but that can vary greatly depending on your past expertise and how you prepare. There are no deadlines for completing a program, and you can take as long as you need. Examinations must be scheduled at least 2 weeks before your desired examination date, the strategic project must be submitted in conjunction with an examination date request. No examinations can be scheduled without a project submission.Examination dates and deadlines to schedule your examination can be seen here. To schedule your examination, please use the scheduling form here. Registration for the courses is $499 for a single course or $49.99 for 10 months under our monthly payment plan. Our Master’s Certification provides the most benefits and is the most cost-effective way to advance your career prospects. The cost to take five courses and earn a Master’s Certificate is $1,299.00. View our Master’s Certification benefits here. There are no technology fees, testing fees, travel costs, or special software to buy. Tuition covers access to all online materials, the examination, grading fee, and the certificate when you pass. The only fees not included, as with most programs, is that of the textbooks. All of the books required for our programs can be found at Amazon.com, Barnes & Noble, Chapters, etc. If you cannot afford tuition paid in full, we have payment plans available. We also offer the opportunity to apply for a needs-based tuition scholarship. To do so, please submit our business scholarship application. Our programs are offered 100% online. Examinations are held on the 10th of every month, giving you 12 options each year to complete your required examination(s). There are no testing centers, and no set time that you need to take your exam on the date of your examination, but you will only have 2 hours to complete the online test. You will be timed through our testing software online, and you will only be allowed to log in once. Be sure you’re ready to begin your exam before you log in! You will also need a stable Internet connection. Your login and password for the exam will be made available to you the night before your scheduled exam. You will then have 24 hours to access the exam as of 12 am on the date of your exam; again once the exam is accessed you will have 2 hours to then complete it. (This is based on Eastern Standard Time [GMT -5].) Please do not sign in until you are ready to complete the exam. To schedule your examination, please send your completed project and examination date request at least two weeks before the scheduled examination date. If you have specific questions about your program, please visit the study guide and syllabus located on the program homepage and login page. If the study guide does not help, please review the rest of our FAQ here, or email our team at Team@BusinessTraining.com and we will help answer your question. We have experts assigned to each program we offer who helped choose the books, create the study guide, and record the video modules for each of our programs. If you have specific content questions, we will be happy to have our program experts assist you. Grading begins after you have completed your exam, and results will be sent to all participants approximately 30-days after the date of your examination. For example, if your exam was taken on January 4th, you will get your graded project and examination score on approximately February 4th, 30 days later. When you pass, you will be issued a PDF certificate, a hard copy can also be ordered as well. Further details regarding certificate options will be provided with your passing exam grade. If you do not pass, you are welcome to re-take the exam for $199. You can register to re-take the exam with us over the phone, with our form here, or by email at Re-take@BusinessTraining.com. How can I utilize the “author status” position I have earned as alumni? Review the sites within our network and then write a 100% original piece of advice, best practices, an email-based interview, or a book review related to one of those topics. Our team will then review the piece and if it fits the goals of the site it will be published with your byline or link back to your personal website, profile online (like LinkedIn.com), or elsewhere. To submit an article, please email us at Team@BusinessTraining.com. Some professionals are proactive and take their level of knowledge and career seriously. They constantly re-invest in themselves and improve how efficiently and effectively they can produce results for their employers. However, some other professionals are very slick talkers and marketers of themselves and they can sometimes outshine the genuine hard working and well-trained professionals who would help your company make more money. The certification programs we offer are the most challenging in the business world and if someone has completed one or several of these it is because they have dedicated hundreds of hours to studying these concepts and best practices and at some level have mastered them. If you would like to apply for a needs-based scholarship discount please submit our business scholarship application. Our programs are built based on what is practical and used in the marketplace today. We do not use traditional textbooks or even professors in most cases; instead, we rely on expert interviews, what really works in the real world, and case studies. Our programs can help select members of your company or whole teams move up the learning curve in just 2-4 months within several high-value niches that can pay dividends back to your company in more effective, efficient, creative, and motivated employees. If you pay for an employee or set of employees to complete our program and they do not receive valuable best practices, tips, and valuable strategies you may email us and request your full tuition refund during the first 7 weeks of your registration. We are dedicated to making our programs worth not just $99/ subscription, but at least $3,970 each – our goal is to create programs which are worth at least 10x more than the tuition paid for them. What makes the certification programs offered at BusinessTraining.com different from other professional designations? – The certification programs we offer are not mandated by a university, not based on theory, and do not slog through slow-moving 400-page textbooks. Our programs are built based on what is practical, considered a best practice, and is valuable today in the real business world. – The business designation and certification programs we offer are on a $88.75 Monthly subscription which we open up all 18 courses, less than a typical 3 credit course at a university – yet you receive more practical knowledge and training and you are able to add this third-party verification of your specialized knowledge to your resume. What will I be able to add to my resume after completing this program? What tangible benefit will I receive from the Business Training Institute? In terms of positioning my knowledge and skills against others competing for similar jobs, how can these certifications help? Participants who complete our program and pass our challenging examination should add a new entry to their resume or online business profile along with three bullet points which describe the new tactics, abilities, and strategies the participant has picked up within the program. Please login to Business Training.com after you have registered to view suggestions on what may be added to your resume once you have completed the specific program you have signed up for. A Master’s Certification looks best on your resume, the benefits of this program can be seen here. I live outside of the United States, can I still earn one of your business certifications? Yes, we have crafted the designation programs that we offer so that you may take the test online from anywhere in the world. By using a dual-layered IP tracking and password system, and by making the exam timed we allow participants to complete the examination from their place of work or home anywhere in the world. In the past 18 months alone we have had participants complete our program from the UK, Switzerland, China, India, Australia, South Africa, Canada, Mexico, Egypt, Saudi Arabia, Japan, Russia, Brazil and more than 75 additional countries. I know that I want to earn one of the Business Training Institute’s certifications. How do I register for the program? I have read that your certification programs are very challenging and rigorous, what happens if I do not pass the exam? Can I take it again? Yes, anyone who has failed one of our programs may take it a second or third time. Also if you miss your examination date this is considered a failing grade as well. If you miss your scheduled exam date or fail the exam there is a $199 fee to re-take the exam, complete this form by clicking here. Yes, you may receive a full refund if you decide not to complete the program. We provide a 100% no questions asked a refund within the first 7 weeks regardless of the reason. This allows you to evaluate our study guide, required readings, and the industry tools and educational video content provided to you within BusienssTraining.com and the BT Business Association as part of your membership. To cancel your registration, please send us your request via email to team@businesstraining.com. I would like to change my scheduled exam date. Am I able to do so? Of course! Just send an email at least 2 weeks before your scheduled exam. Please send this email to our team or your program director (found on the program’s homepage or syllabus) and we can update our roster accordingly. Since we offer on-going registrations and the option to set your exam after you feel you have had sufficient time to prepare, you may not need to change your exam date except in the case of an emergency or schedule-change. Please be sure to let us know if you need to move your scheduled exam at least 2 weeks before your scheduled exam.If you do not change your exam date at least 2 weeks before your scheduled examination and you miss your exam, you will be required to pay the $199 re-take fee. You can do that and complete the retake form here. This is the same fee paid by those who fail the exam, and to avoid this fee, please contact us in a timely manner. This policy had to be put in place as we now serve 1,000’s of participants and alumni, this means last minute changes are no longer possible. First, register for a program and then log in to BusinessTraining.com to gain access to the resource hub for this program. There you find will the multimedia resources, list of required readings, study guide, and tips for completing that specific certification program. Right now, every one of our required books is available on websites such as Amazon.com, Half.com, and Borders.com, and if you are based in the United States over 80% of these books may be obtained for free from your public library. You are welcome to complete as many courses as you’d like! If you are working full-time or completing other coursework, we would recommend that you complete no more than two certification programs simultaneously, but you get to set your own personal limit. There is no deadline, and if you find you need to complete one at a time, you are able to do so. This is why it is most advantageous to register for our Master’s Certification, you can take as long as you need to complete (5) programs of your choosing. Each of our programs is built as continuing education and professional self-improvement programs, but there are no prerequisites to join at this time. To pass you must earn a grade of 80% or higher between your examination and project. While the exam is designed to be rigorous and thorough most individuals who have read the required readings and invested a significant amount of time studying for the test should do well. The exam is offered 100% online so you may complete it from your place of work or from home if you wish. The exam uses a dual-layered IP tracking and password system to prevent abuse and it has successfully been used with over 15,000 program participants in the past. Your grade will be averaged from your examination score and project score, which are each worth 100 points. You must earn at least 160 of the 200 available points. Just an overall grade of 80% is all that is required to pass the exam. These points can be earned in any section of the exam. The Strategic Project is 50% of your grade and the Examination is the remaining 50%. Our programs have been designed for experienced business professionals and students alike. As a student, you will gain critical knowledge needed to compete in the area of business you prefer to work in. Our programs can also assist in obtaining internships; our team provides networking, resume construction, resume templates, and internship video advice resources. Starting your career with this knowledge base can save you years of job experimentation within various roles. 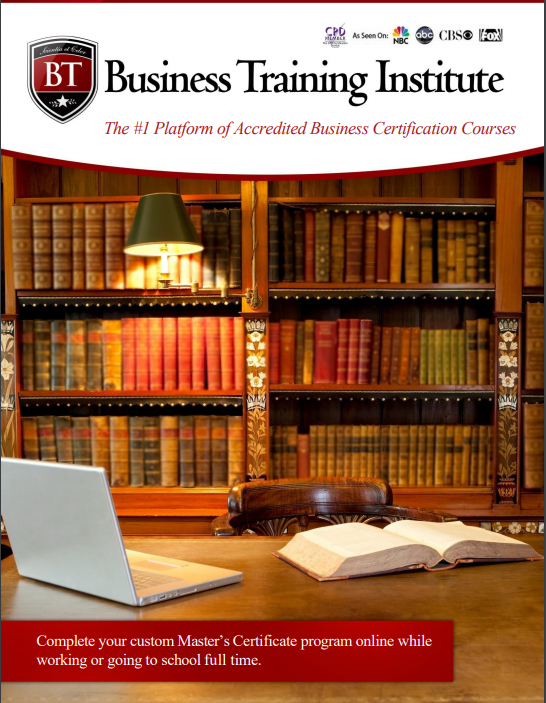 As a Business Training Institute certification holder, you have an advantage over others with the same degree. Employers seek those who have taken the initiative to gain additional knowledge relevant to their career. To ensure that everyone can register for our programs, we offer a number of ways to pay for tuition. We accept the web or fax-based credit card and debit card orders, payment by check, Western Union payments, or Paypal. You can also call our offices during normal business hours to register for our programs over the phone. Please feel free to call our office at (305)503-9050, Monday through Friday, from 9am-5pm EST. Payment Options: Register online by using our form below or enroll by using our Payment Options Form. If you need help, call us at (305)503-9050 or email us at Team@BusinessTraining.com. Most professionals take 75-100 hours to prepare for our exams. The specific program and your past experience and/or education can affect this, however, by reducing or adding an additional 25 hours to these estimates. We have built our programs to be the most challenging business certifications available. They are not easy and take consistent studying, reading, and reviewing to complete. This lack of ease helps to build credibility and respect for those holding these professional designations. Programs that are easy to pass, not challenging, and low quality, do not increase or improve one’s professionalism. How much would a Master’s Certificate cost to complete and what do I actually get for that? The cost of the Master Course is $1,299.00 or you can choose the subscription plan which is $88.75 monthly and you can take any of the 16 courses and not have to pay $199.00 to re-take the exams in the off chance that you fail. Our program fees cover tuition, registration, access to our online video, audio, and document resources. It also covers the examination fee, grading fee, and designation fee, as well as the certificate when you pass. The only fee you may incur may come from needing to retake an examination if you failed the first time. There is a $199 fee to reschedule and retake an examination unless you are under the unlimited access subscription plan which waives this fee. You are welcome to complete as many of our certification programs as you would like. We recommend completing one or two programs at a time if you are also working or completing coursework elsewhere, but you get to set your personal limit. Five training programs within our platform can be taken for just $1,299.00 and will earn you a Master’s Certificate. Thank you again for visiting us here at The Business Training Institute. If you can’t find an answer to your questions above please try our click to chat service, email us at team@businesstraining.com or call us at (305)503-9050. Content Tags: How can I complete an online business certification program?, how does online business training work?, how can I complete business training online? Why complete online business training? What is a business certification program? Download our Catalog and Join our mailing list to receive the latest news and updates from our team.